This article addresses some marijuana myths. Because of significant misinformation regarding marijuana over the past few decades, some myths have persisted for a long time. Myth #1) Marijuana causes fatal overdoses. Answer: Marijuana has caused no fatal overdoses. Over 24,000 yearly overdoses from narcotics kill Americans – this is second only to car accidents for unintended deaths. Marijuana has never played the primary role in a fatal overdose, as it does not act on the respiratory center like narcotics. Narcotics, on the other hand, may decrease the respiratory rate fatally, especially if the drugs get mixed with alcohol, muscle relaxers, or other sedatives. Answer: This is actually true, with the following explanation. As marijuana is smoked or vaporized, THC enters the bloodstream, then about 1% reaches the brain and the psychoactive effects ensue. After a few hours, the THC levels in the brain falls below that needed to be psychoactive. THC is lipid soluble so fat cells uptake the THC as it travels around the bloodstream. They sit in the cells for a while, then get slowly released. This can take days to weeks, so it is true that marijuana may stay in the human body for 30 days. The THC has no psychoactivity in the fat cells so after those first few hours of psychoactivity no one is high anymore. Final excretion may take a few weeks. The bottom line is it can stick around in the body for weeks, but only remains psychoactive for hours. Myth #3) Is Cannabis harmful to the immune system? Answer: Research from the 1970′s evaluated the T cells of both marijuana smokers and non-smokers. T cells help fight infection and are deeply involved in the immune system. This early research showed decreased immune responses in the T cells of smokers, leading the researcher to say marijuana weakens the immune system. However, numerous scientists have studied marijuana’s effect on the immune system since, and none have reproduced the results. No difference exists in the immune systems of marijuana smokers versus non-smokers. When the FDA was approving the synthetic THC Marinol in 1985, they found no concrete evidence that THC reduced immune function. They looked at a large body of research concerning the effects of THC on humans. The bottom line is that cannabis does not cause immune dysfunction in humans. 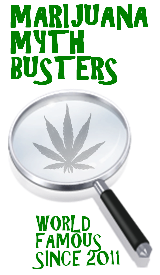 This entry was posted by Mythbuster on April 19, 2012 at 1:22 am, and is filed under Marijuana Myths. Follow any responses to this post through RSS 2.0.You can leave a response or trackback from your own site. From the beginning of the AIDS epidemic, opponents of medicinal use of marijuana have argued that it is particularly harmful to people with AIDS because of adverse effects on the immune system. This followed unconfirmed reports in the early 1970′s that marijuana weakened the body’s response to disease. Several researchers have since been unable to find supporting evidence that cannabinoids actually harm or reduce the number of T-cells in the body. In spite of all the claims, in 1992 the Food and Drug Administration officially approved the use of synthetic THC (Marinol) in the treatment of AIDS wasting syndrome.